As a parent, I find that one of the greatest joys of celebrating Christmas with young children is the magic of Santa. I have my own fond memories of leaving a stalk of celery for my favorite reindeer (Blitzen, of course) and ensuring that my father put out the fire in our fireplace before he went to sleep (he always did). Now as the mother of two young girls, the unmistakable look of utter delight and joy in their eyes on Christmas morning is something you can’t wrap up and put a bow on; it’s a gift I savor each year. But if you find that your own children are less convinced about the existence of the Man in the Red Suit, maybe you could use a little help. 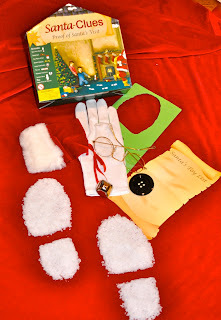 Santa-Clues delivers the proof that Jolly Old St. Nick did, indeed, pay a visit to your home. In a neat little house-shaped box are Santa’s glove, glasses, coat button, a piece of his red suit, coat button and even a toy list. Stencil designs let you make boot prints and even reindeer hoofs, complete with magic snow. While you may not decide to use all of these supplies–less can be more, depending on the child–you’ll certainly have enough in your arsenal to proclaim his arrival. In a Nutshell: Skeptical about St. Nick? Yes, Peyton, there is a Santa Claus.